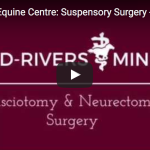 Mid-Rivers Equine Centre is based on the belief that surgical intervention serves many vital roles in the health of our patients. Since our founding in 1987, it has been our deepest conviction that the St. Louis area needed a well-equipped and skillfully trained equine surgical staff available to horses on a 24/7 basis. We have spent over three decades building just such a team and equine hospital. 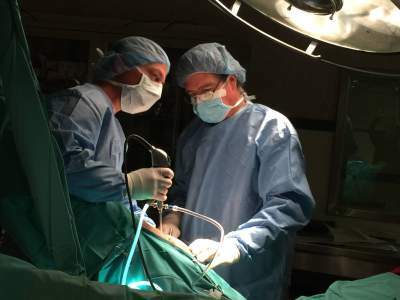 Dr. Baxter and Dr. Hartman In Surgery. Our fully equipped surgery suite is wholly prepared for surgeries, be it advanced, elective, or emergency. Because of the many surgeries we regularly perform at Mid-Rivers Equine Centre, we are no strangers to handling a wide variety of equine medical conditions. Our staff of experienced veterinarians has over 25 years of experience and 40 hours of required continuing education each year. 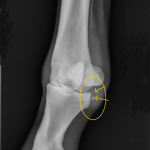 That way, you can rest assured that our staff is experienced and professional and educated with the latest advancements in the equine medical fields. Our advanced surgical and diagnostic equipment helps ensure that your horse gets the best treatment possible. The health and safety of your horse before, during, and after surgery is our top priority. We provide stock for surgery so your horse is not injured as they are laid down or anesthetized for surgery. 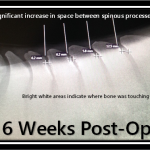 During surgery, we understand that you may be nervous or want to be with your horse. We care about and respect your relationship. That’s why we provide a viewing window where you can watch the surgery so you can be with your horse every step of the way. When your horse is out of surgery, they will be transferred to a fully padded, closed-circuit monitored recovery room where staff keeps watch to ensure your horse safely wakes and stands after surgery. We will keep you updated as to their condition and provide you with the information you need for post-surgery care. 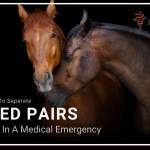 At Mid-Rivers Equine Centre, we are fully prepared for emergency surgeries 24/7. If your horse is experiencing an emergency, do not hesitate to call us day or night. 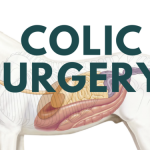 Is My Horse A Candidate For Colic Surgery?